The rapture: Hoax or Hope? Needless to say, the above image is not of a past event. individuals superimposed on a picture of the sky. A very brief description of the rapture is found in the Bible -- 1 Thessalonians 4 -- and is supported in other passages. Unfortunately, the Bible is ambiguous about exactly when the rapture will occur. Most believers in the rapture suggest that it will happen just before the expected seven-year Tribulation -- a time of great suffering, instability, the devastating War of Armageddon, and the largest genocide that the world has ever seen. Some suggest that it will happen just after the Tribulation when Jesus finally returns to Earth. The doctrine of the "post-tribulation rapture" was taught by Christianity starting in the first century CE and was popular until the 19th century. It is still held by some Christians. It teaches that when Jesus Christ returns to earth after the tribulation, believers who are alive at the time will be changed into immortal glorified bodies. A relatively new competing belief promoting a "pre-tribulation rapture" was developed during the 19th century and has become a near universal belief among fundamentalist and other evangelical Christians. This belief has Jesus returning towards the Earth before the tribulation. Christian believers -- both dead and alive -- will rise in the air to meet him in the sky. It will occur without warning. Believers in the pre-tribulation rapture have eagerly anticipated the event since the 1840s and have never given up the hope that it will occur in their very near future. 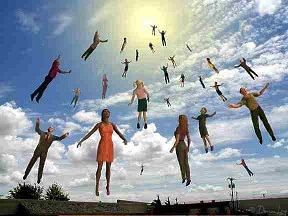 Harold Camping, founder of Family Radio, once predicted that the Rapture would occur on 2011-MAY-21. It didn't. Introduction: What is the rapture? The main biblical supporting passage at 1 Thessalonians 4. Additional Bible verses. When will it happen? What will happen during the rapture? About the "secret rapture." Will the end of the world happen in the immediate future?